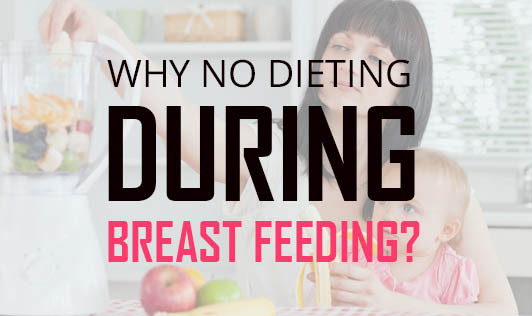 Why No Dieting During Breast Feeding? It's a great idea to lose weight after child birth! You will probably be eagerly waiting to lose that extra bulged body and look fit. But before that, have you thought of these key points? 1. When should a breastfeeding mother start dieting? Your little one depends on your milk to fill its tummy through breast feeding. You should wait till your baby starts feeding on other foods and extracts its nutrients. Your diet can affect the milk production too1. So, ideally weight loss only after six months of child birth is better! 2. What if I start dieting before that? c. You might not feel like eating anything as you are tired most of the time taking care of your baby. All these body changes might settle within 2-3 weeks of delivery. Your body will need to get back the lost nutrients and blood during delivery. Hence, another 3-4 months of the right diet would be a good foundation for a weight loss program.